The Dallas Cowboys take yet another blow in the player personnel department. This time, star linebacker Sean Lee goes down with a hamstring injury and could miss several weeks. Jaylon Smith should see the bulk of Lee’s work with Justin Durant possibly getting some snaps as well. Racking up 14 run stops on 118 run-defense snaps, Lee produced a run-stop percentage of 11.9 percent, the top mark among 4-3 outside linebackers this season. Lee’s overall grade of 84.0 ranks 12th among linebackers, placing Lee near the top of the league at his position once again. 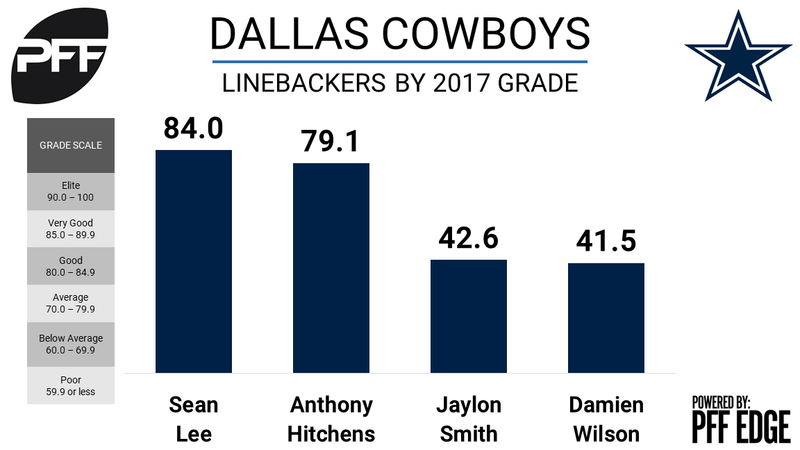 Looking to Smith as the primary replacement to Lee, the Cowboys might see quite the drop off in production defending the run, as both his run-stop percentage of 7.5 percent and run-defense grade of 33.9 rank 50th and 67th respectively.